Rants, raves, and random thoughts from a concerned citizen and truth addict. My wife and I just watched Iraq for Sale tonite. I thought it presented some good information, and personalized it just enough without it being overly sad or emotional. A brief summary... 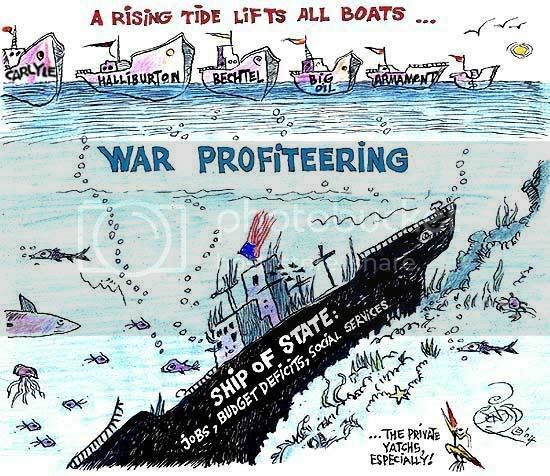 It shows that through "good old boy" connections, billions of dollars in contracts have been awarded to private companies to do work that should be carried out by the US military. these private companies not only mismanage this work with regularity, but also do not have the same accountability to the American people as the military does. I did find one very important omission/misdirection inherent in its main argument. The money that is used to pay for much of the billions in contracts for the outsourcing of military services does not come from our tax payments. No, they already spent our taxes on their legitimate budget, which doesn't include much of the expenses of the war in Iraq. Y'all remember that much publicized "$87 billion" for the war that was debated in 2003... It is what's called extrabudgetary spending. Essentially, this money did not exist before it was "spent." To create the money, the Treasury gives a bond to the Federal Reserve and the Fed in turn makes an electronic deposit in the Gov't account, who delivers the money to one of several private companies. These companies then disperse this new money into the economy (money that was created without an equal exchange of labor) causing the value of the rest of our currency to go down. Hence part of the reason behind the 400% increase in the price of gold since the "war on terror" began... So yes, we taxpayers do pay for it, but via inflation and not increases in our taxes. If we had to pay for every cent of the war via taxes, there would surely be revolution because our tax bills would skyrocket across the boards. Apparently the URL's for Thomas are static, so I won't link directly to it. There were others too. There's a section in the special features titled "Important Votes" that shows most of the debate. Unfortanately, in many cases I think the Republicans "win" these arguments because they are attacking the structure of the legislation and its vagueries and the Democrats are just talking about what they intend for the legislation to do and how could you vote against that?? sadly, the answer is because it was very poorly worded. Despite these critiques--which are minor in the face of the gravity of this issue in general--I highly suggest watching this film. HR 6166: The end of political freedom? Remember what peace really means?